A mysterious plane similar to a World War Two bomber has been spotted flying over Derbyshire by several witnesses. The Derby Telegraph says that a number of people have been in contact to report the unexplained sighting of a plane flying 'extremely low'. 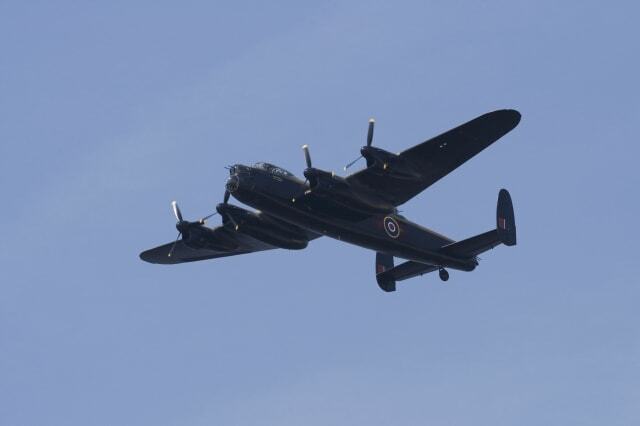 The large prop-driven plane has been described by some as looking very similar to a Lancaster bomber (pictured above). Witness Richard Jephson, the first to report the sighting, says he was left 'speechless' by the incident. Speaking in the Lincolnshire Echo, he said "... the plane was so low that you could touch it - but it was completely silent. He said he and his wife braced themselves but nothing happened. Two other witnesses have reported seeing a plane flying low across the county at around the same time. One, who was on the A52 from Derby, said the plane had camouflage and an antenna. There are no reports of an air display or scheduled flypast at the time. One theory that the 'phantom plane' was in fact a helicopter was dismissed by witnesses. The area has been subject to several sightings of mysterious planes in the area, with some unexplained sightings of similar 'silent' planes flying low in the sky. In May, a low-flying Russian spy plane was spotted in Lancashire, just miles from a NATO monitoring station. It was since discovered that the plane had been given permission by British authorities to fly in the area. With its rolling hills, rocky peaks and multitude of colours, this otherworldly site looks like no place on Earth. The spectacular lunar landscape can be found at the Zhangye Danxia Landform Geological Park in Gansu Province, China. Like one giant red, orange and yellow-hued paint spattered artwork, the park offers breathtaking views that blaze with colour. The unusual colouration in the rocks is the result of red sandstone and mineral deposits being laid down over 24 million years. Ukraine's leafy Tunnel of Love, near the town of Klevan, is a three-kilometre section of private railway that serves a nearby fibreboard factory. A train runs daily through the ethereal tunnel delivering wood to the factory. At other times the beautiful avenue of trees is witness to a very different journey - love. It is a favoured spot for young romantics to stroll with their special someone. The magic happens in spring when the trees that line the rails burst into life and create a leafy enclosed arch over the track. It is said that couples can come here to make a wish and if they are sincere in their love it will come true. The Whitsundays' Whitehaven Beach is a pristine beach stretching seven kilometres, gently lapped by rippling waves of turquoise and aquamarine. The sand at the Australian beach is so pure and white that it is 89 per cent silica, and is believed to have been brought to the beach from sea currents over millions of years. This giant hole in the Karakum Desert has been burning for over 40 years. Named by locals as 'The Door to Hell,' the crater in Turkmenistan was created by Soviet geologists in 1971 who were drilling at the site and tapped into a cavern filled with natural gas. The ground underneath the rig collapsed and left a hole with a diameter of 70 metres. The team was afraid the hole would release poisonous gases and decided to burn it off. They hoped it would be put out after a few days but the hole has been burning ever since. Its golden glow can be seen for miles. Historic park Keukenhof is the world's largest flower garden, with more than seven million flower bulbs planted every year. In spring, you can see the spectacular collection of tulips take over the park with their bright colours of pink, orange, purple, yellow and orange. The unique park in Holland also has carpets of hyacinths, daffodils, orchids, roses, carnations, irises and lilies, making it appear as something out of The Wizard of Oz when they are in full bloom. This salt lake in South Australia is surrounded by brilliant red sand hills and the shimmering surface is a photographer's dream. When standing in the centre of the surreal Lake Gairdner, the horizon seems to disappear. The site hosts the annual Dry Lake Racers event in March. The To Sua Ocean Trench (which literally means 'big hole with water') is an idyllic site located in Samoa's Lotofaga village. The trench is surrounded by beautiful manicured gardens with views out across the Pacific Ocean. A ladder is installed allowing visitors to descend 15 metres down into the trench filled with turquoise waters and lit up by the bright Samoa sunshine. The gurgling sounds of the water can be heard through the underwater caves linking the trench to the ocean. The Arashiyama Bamboo Forest in Kyoto is a 500-metre pathway through the Sagano Bamboo Forest. It is one of Japan's most picturesque natural environments and is known for the sound that is made when the wind blows through the thick bamboo grove. The music was even voted one of Japan's must-preserve sounds. Western Australia's Lake Hillier is a bubble gum pink-coloured lake that is surrounded by a rim of sand and dense woodland. It is a complete mystery to scientists, who have never been able to identify why the is pink. Some say the colour comes from a dye created by bacteria living in the salt crusts. The lake is best viewed from the sky, but there is also the Pink Lake lookout, which offers stunning views of the 600-metre-long lake. The uninhabited island of Staffa is home to Fingal's Cave, Scotland, which is formed entirely of hexagonally jointed basalt columns - the same as the Giant's Causeway in Northern Ireland. A walkway made of fractured columns allows visitors to go far inside and during spring and early summer the cliffs and grassy slopes provide nesting sites for various seabirds including guillemots, razorbills and puffins. This spectacular blue cave or grotto can be found on the remote limestone island of Bisevo in Croatia. The Blue Cave is at its most beautiful between 11am and noon when the sun’s rays pass through an underwater opening to create a beautiful blue light. Boats can be taken inside the cave, but for a surreal experience you should take an underwater swim to see the rocks glimmer in silver and pink. Visit Mount Teide in Tenerife to see the strange phenomenon known as the Sea of Clouds from Spain's highest peak. This happens when the moist trade winds (sea level) condense as they rise over the steep northerly slope of the island and meet drier, warmer winds coming from the Azores at a higher altitude. The result is an extraordinary thick 'blanket' of white clouds at the foot of Mount Teide. Visitors to the Mount Teide National Park, at an altitude of more than 1,700m above the sea of clouds, can enjoy the volcanic landscapes with perfect blue skies and the weird experience of being above the clouds. The surreal landscape of Cappadocia is characterised by subterranean cities, cave houses, fairy chimneys and winding valleys, and is one of the most enchanting places on the planet. The otherworldly landscape is best enjoyed from the sky on a hot air balloon ride, where you can see the extraordinary rock formations, vineyards and villages of the historical region in Turkey. The breathtaking Crystal Cave of Svmnafellsjvkull in Iceland's Skaftafell National Park is a glistening wonder with its brilliant indigo and aquamarine hues, and unique snap, crackle and pop sounds. Created by the Vatnajvkull ice cap in the south of Iceland, the cave is accessible through a 22ft entrance on the shoreline and is a tight squeeze towards the end where it is no more than four feet high. The Alofaaga Blowholes in the village of Taga on the Samoan island of Savaii are a sight to behold. Carved over centuries, the blow holes are formed by the sea water being forced up through tiny cracks in the volcanic rock as it meets the ocean and show wave power in its purest form. At their most forceful they can propel huge jets of water 20 metres in the air and are particularly worth watching when locals throw in coconuts watching the jets effortlessly demolish the heavy shells with the sheer force. Madagascar's Tsingy de Bemaraha National Park is famed for its labyrinth of limestone pinnacles, known as tsingy. Formed over centuries by the movement of wind and water, the jagged needles tower several hundred metres into the air and are a spectacular sight. There are walkways and bridges to help visitors climb on top of the smaller tsingy. The Cano Cristales is a river in Colombia which displays a vibrant explosion of colours for a short time each year. It happens when the water level drops and the sun warms the moss and algae at the bottom of the river, making the blooms turn bright red. The amazing transformation can be viewed for a few weeks from September to November. Image: Flickr/megavas. Used under Creative Commons license. Every year for a few weeks in February, Yosemite National Park's Horsetail Fall appears to turn into flowing lava in an extraordinary natural display. As the light hits the top of the rock face a miraculous transformation takes place. Suddenly the rock glows a breathtaking orange and red, appearing more like a volcano than a waterfall. The incredible phenomenon occurs only in February at Horsetail Fall, a seasonal waterfall which is part of the El Capitan rock formation. The Gothic-style Kromlauer Park in Germany is home to the ancient Devil's Bridge, which is said to have been built around 1860. A unique feature of the bridge is its reflection on the water's surface creating a perfect circle. Brazil's Lencois Maranhenses National Park is an ecosystem formed of sand dunes, known as white sheets (lencois) and freshwater lakes of changing colours. The seasonal lagoons fill with rainwater, mainly during the first six months of the year, creating a unique landscape. The National Park was formed over thousands of years and is actually a desert. It is home to a variety of fish, despite the almost complete disappearance of water during the dry season. Its stunning mountain scenery inspired the film Avatar and the Zhangjiajie National Forest Park is one of China's most breathtaking spots, with its floating pillar-like formations and dense foliage. One of its towers, the 3,544ft Southern Sky Column, was even renamed the Avatar Hallelujah Mountain following the movie's success. Fly Geyser is a man-made geothermal geyser reaching around five feet high in Washoe County, Nevada. It sits on a seven-foot mound and was created accidentally when drilling took place at the point in an attempt to find sources of geothermal energy in 1964. Although people are not entirely sure why it occurred, it was most likely due to the well being left unplugged, leading to the accumulation of dissolved minerals which rose to the surface and created the mound on which the geyser sits. Plumes of hot water continuously spew up to five feet in the air, which fills the numerous surrounding terraces of pools with water. It is the brilliant green and red colouring caused by thermophilic algae which makes the geyser so remarkable. Dark Hedges is a beautiful avenue of beech trees dating back to the 18th century. The eerie avenue, in Northern Ireland, is said to be haunted by the 'Grey Lady' who appears at dusk among the trees and silently glides along the roadside. At Conrad Maldives Rangali Island in the Maldives, guests can witness the phenomenal natural wonder that is bio-luminescent phytoplankton making the beaches glow blue at night. The bioluminescent blue glow is created by millions of phytoplanktons, more specifically the dinoflagellates, in the ocean. These contain luciferase, a chemical that glows in the dark when agitated - for example when a wave breaks on a beach. The blue glowing beaches are seen particularly on moonless nights. Guests at the resort can simply walk along the beach or go on night dives to swim through the glowing 'ocean of stars'. One of the world's most amazing cave networks is the enchanting underworld Marble Caves in Chilean Patagonia's General Carrera Lake. Visitors who make the journey to the remote caves are treated to a unique light show caused by the reflection of the azure water on the marble walls. The incredible blue hues make the caves appear as something from another planet. This mystery rock formation in the Abel Tasman National Park in New Zealand's South Island is in the shape of an apple which has been cut in half. Split Apple Rock sits in shallow water at low tide and according to geologists, the rock split in the Ice Ages when water seeped into a crack.